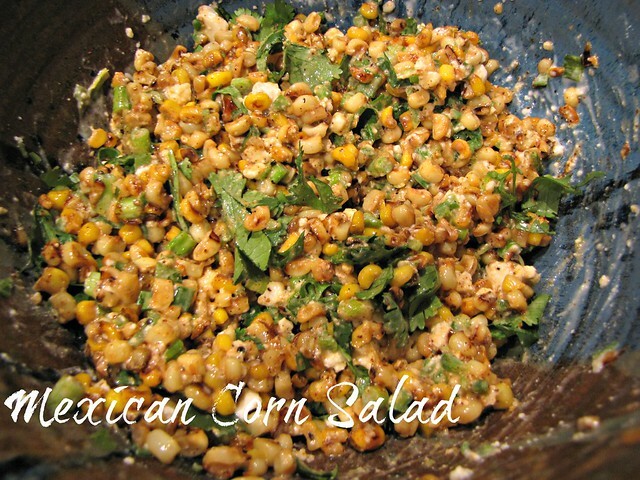 Mexican Corn Salad – Prepare to swoon! 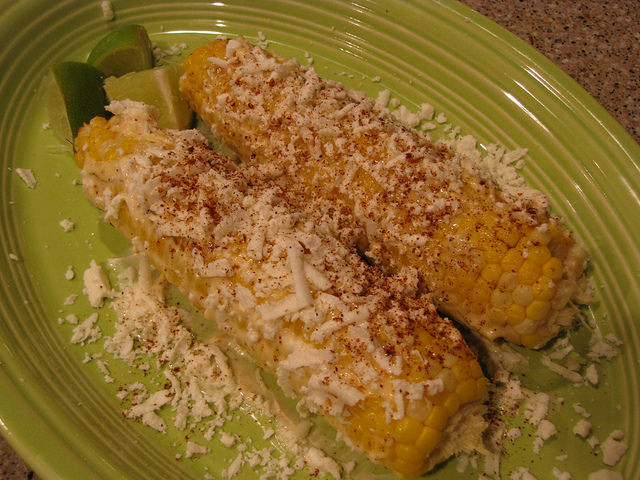 Do you remember last summer when we made Elote or Mexican Grilled Corn? Well, if you skipped it and didn’t try it (like EVERY MEMBER OF MY OWN FAMILY) you have seriously been missing out on the hot & cheesy corn action. I’ll be the first to admit it’s messy. It’s also requires a grill which many of my friends who are apartment dwellers don’t have. 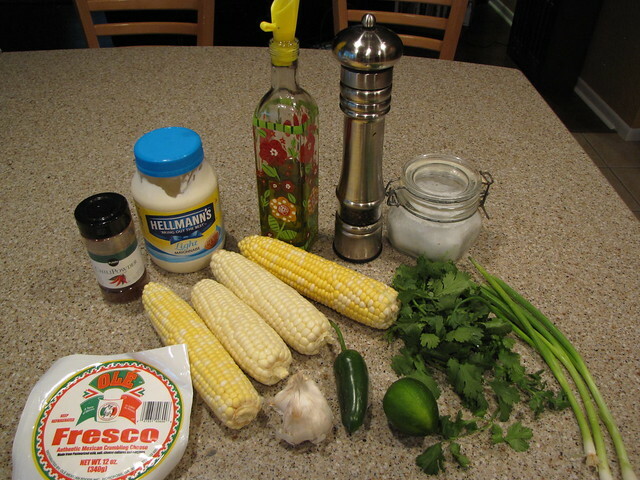 So imagine how happy I was to find a recipe that takes all the great things about Mexican Grilled Corn, makes them easier, and puts them into a funky salad! Fresh Corn (4-6 ears), Green Onions, Jalapeño Pepper, Garlic, Lime, Cilantro, Mayonnaise, Olive Oil, Chili Powder, Queso Fresco, Salt & Pepper. If you’ve ever just plopped corn down on your cutting board and started cutting the little kernels off the cob, you know that it’s a huge mess. The kernels pop off and fly everywhere. You’ll have more corn on your floor and stuck to your cat than you will in your salad. I’m here with a quick and easy corn cutting tip! Grab a small bowl and put it upside down inside a really big bowl. 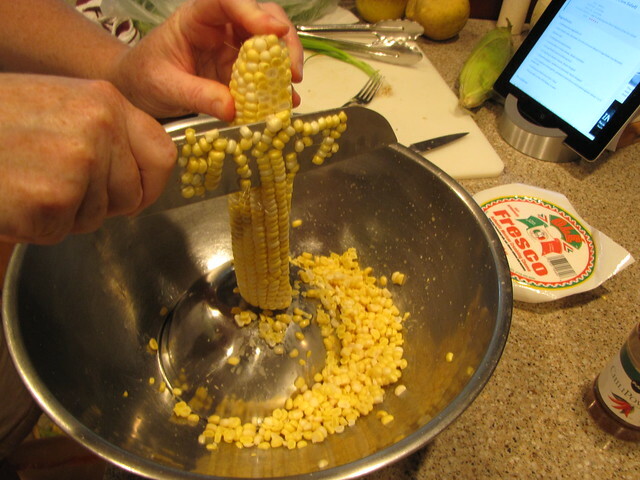 Stand your ear of corn up on the small bowl and cut down the sides to remove the kernels. No fuss, no muss, no flying corn. Works like a charm. I used 5 ears of corn and had a mixture of white and bi-color corn. Grab whatever is freshest at your store. Fresh corn cut off the cob is definitely the way to go for this salad. 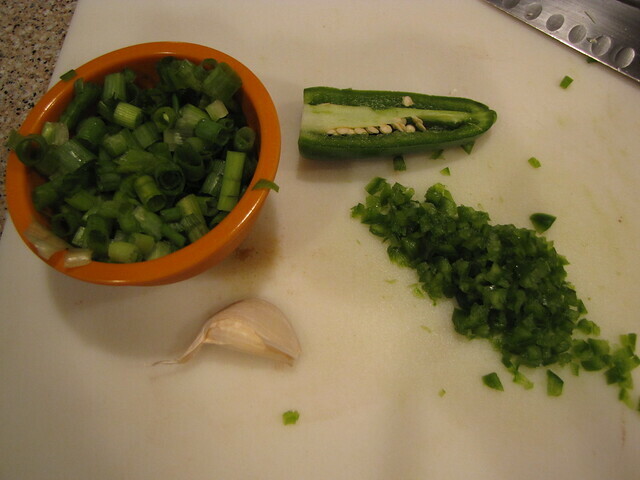 While you’re in the chopping mood, slice up 2-3 small green onions and 1/2 of a jalapeño pepper. If you’re worried about the spiciness factor, rather than leaving out the jalapeño, take out the seeds and the white inner membranes. Half of a jalapeño added flavor but not very much heat. If you like things spicy, toss the whole pepper in there. I also have 1 garlic clove that I’m going to smoosh through my garlic press. If you don’t have a garlic press, use the side of your knife to smash the garlic then remove the peel and mince or chop it up into extremely tiny pieces. 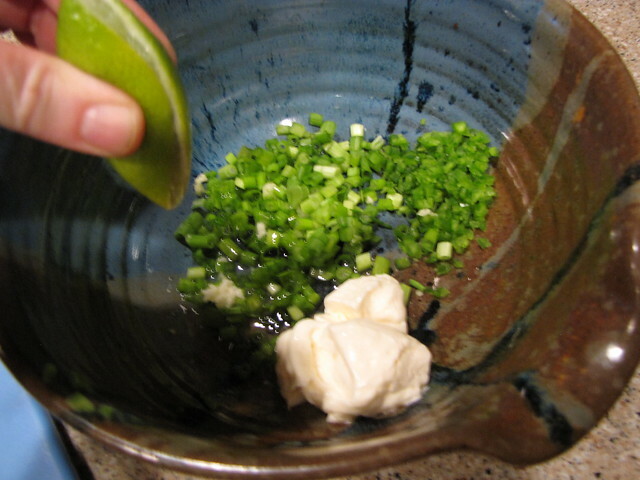 Place the chopped green onions, jalapeño, and pressed garlic clove in a medium bowl. 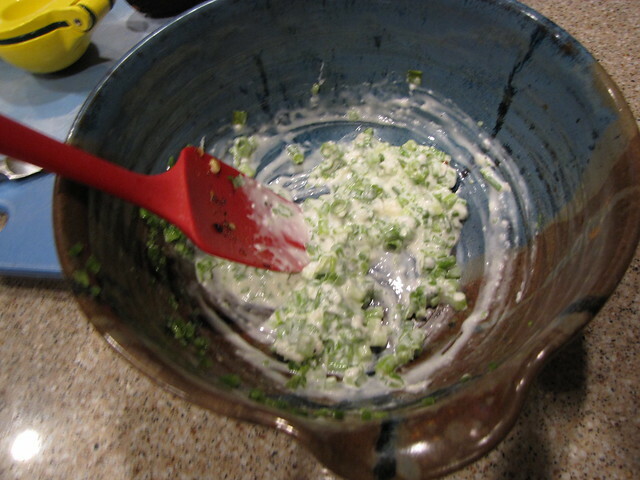 Add 2 Tablespoons of mayonnaise (light is fine) and squeeze in the juice from 1 lime. 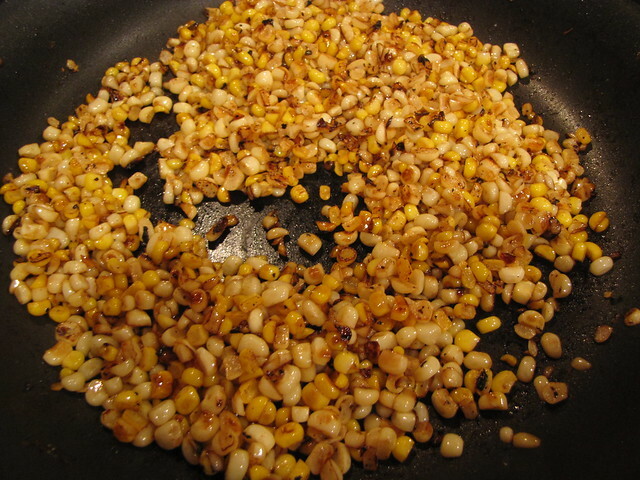 Give it a stir to combine and then set aside while you char the corn. 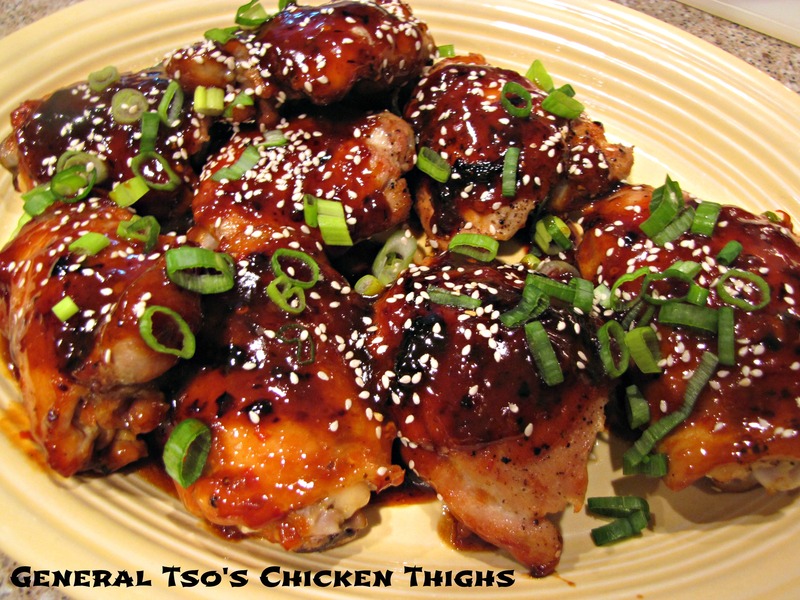 As I mentioned, the beauty of this recipe is that you don’t need a grill or any special equipment. This all cooks quickly right on the stove top. Heat 2 Tablespoons of olive oil in a large non-stick skillet over high heat. 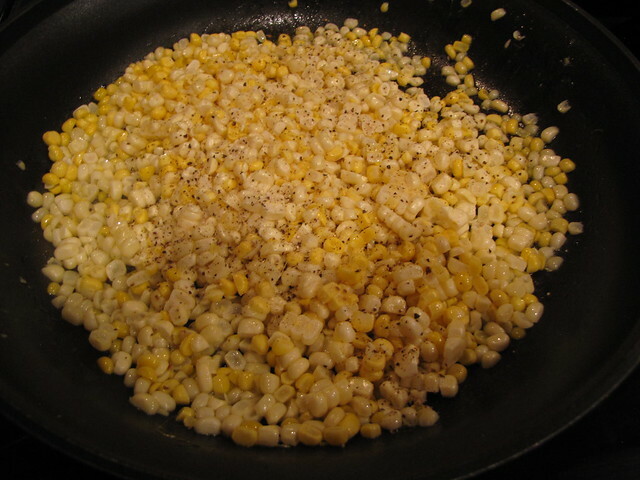 When the oil is hot and shimmering, add the corn and season lightly with salt & pepper. Toss the corn around in the oil so it coats all the kernels then cook the corn without moving it in the pan for about 2 minutes. You’ll see that the corn starts to become golden brown. It will smell nutty and will even start to pop and sizzle in the pan. 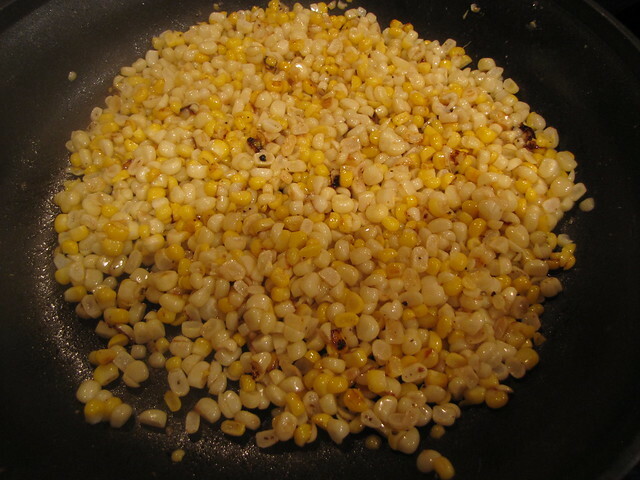 Give it a quick flip or stir and then cook it for an additional 2-3 minutes until most of the kernels are golden brown and slightly charred. 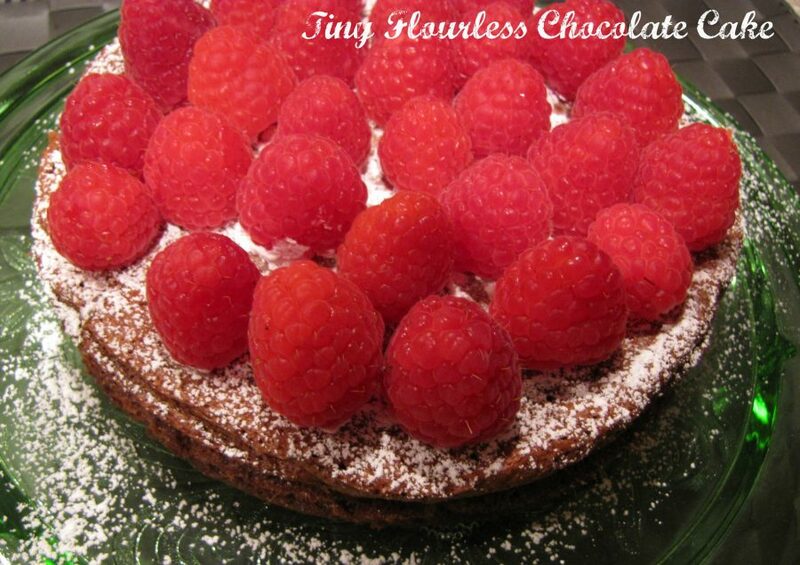 Keep an eye on the heat of your pan and reduce the heat if you are getting black spots rather than golden brown. 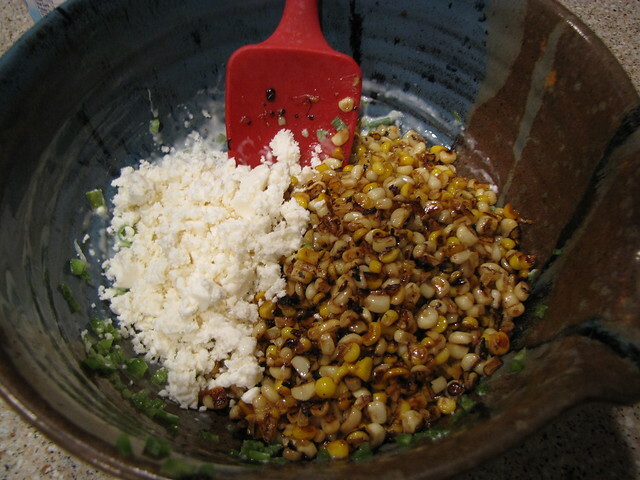 Once the corn has cooked, add it to the bowl. Season with 1/2 teaspoon of chili powder (more or less to taste) and salt & pepper. Add a little chopped cilantro (about 1/4 cup) and stir to combine. 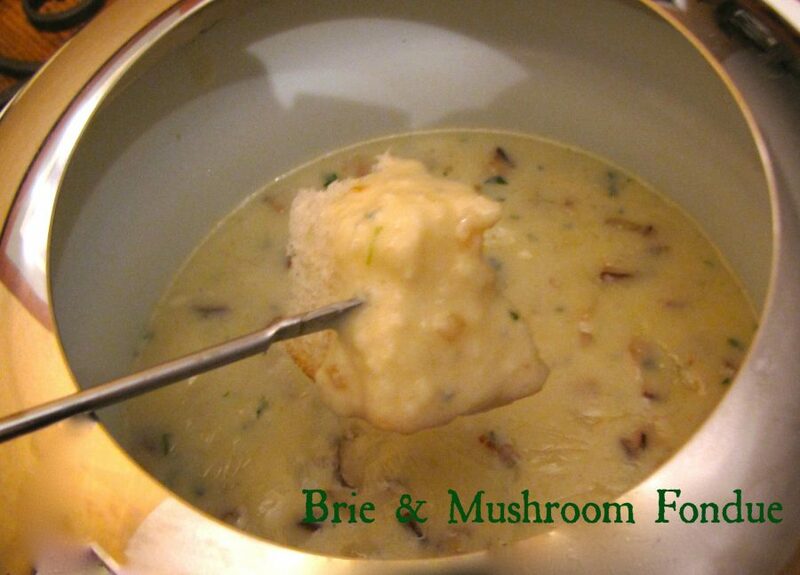 This is best served warm but I was very happy to eat the cold leftovers the next day for lunch. 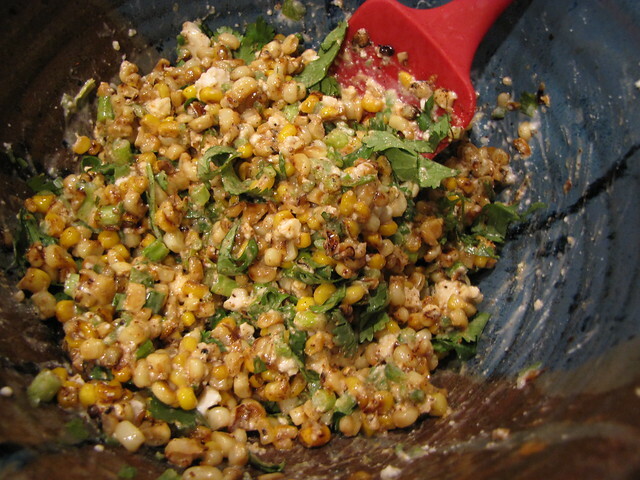 Mexican Corn Salad is the bomb! It’s everything good, golden, and cheesy about Mexican Grilled Corn without the mess. I realized that there was no way I was going to convince some people to eat a big, messy ear of mayo and cheese laden corn no matter how good it is. But I can guarantee that there is no way you would turn down this salad once you’ve tried it. Bookmark or PIN this for fresh corn season or go to the store/farm stand now if you’re in the south and grab all the corn on the cob you can find! As is, this could serve 4 as a side salad but it’s not much more work to make a big bowl. From now on I’ll make at least a double recipe. Trust me on this one! 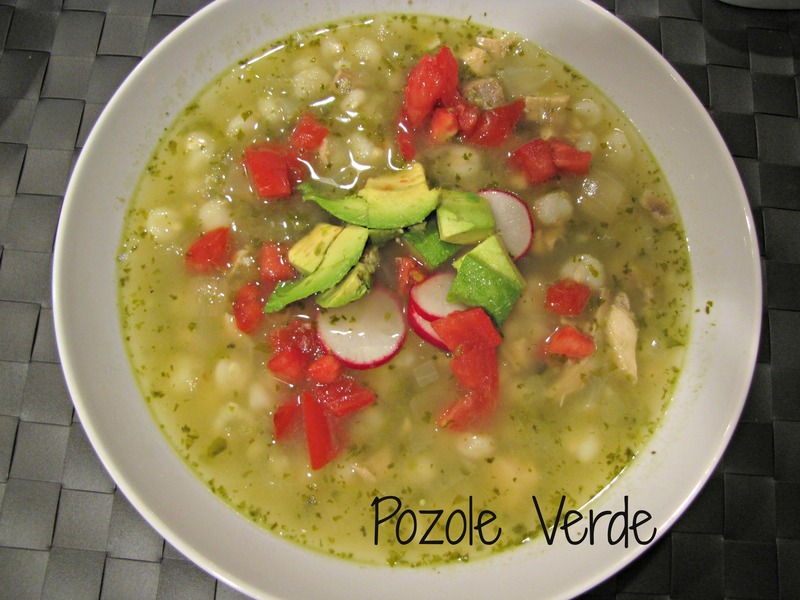 Just in time for CINCO De MAYO! Viva Mexico! A nice crispy Margarita would go well this that one! I miss my lime tree!!!!! I have a little juice left in the freezer from the last batch of limes. Might have to make some margaritas with it this weekend. I’m a big fan of cutting the corn off the cob! Then you don’t have to go floss right after dinner! It was really good. I’m sure you have vegan work arounds for the mayo and cheese.